St. Augustine grass (Stenotaphrum secundatum) is a common warm-season grass that grows in U.S. Department of Agriculture plant hardiness zones 8 through 10. Several different varieties of this common turfgrass exist, each with its own list of benefits. Applying weed killer to your St. Augustine grass lawn is one way to keep the weeds under control, but it also comes with a list of considerations. Herbicides being sprayed over greens on farmland. Your local hardware store likely has several options in the weed-killer aisle. However, two main types of herbicides are available: Pre-emergent and post-emergent. Pre-emergent herbicides work by preventing weeds from growing. Post-emergent, on the other hand, attacks actively growing weeds in your St. Augustine grass lawn. To control weeds before they start, apply a pre-emergent herbicide when the daytime temperatures remain at 65 to 70 degrees Fahrenheit for four consecutive days; this generally falls in February and March for most of St. Augustine grass' growing zones. Fall applications help prevent winter annuals and other weeds from popping up; in fall, wait until nighttime lows remain between 55 and 60 degrees F for four consecutive days, typically in September. While products vary, apply granular pre-emergent over the lawn and apply 1/2 inch of water immediately following application. A common crabgrass preventive product containing benefin and trifluralin recommends applying at a rate of 2 1/4 to 3 1/2 pounds of granules per 1,000 square feet of turf. Products vary in active ingredients and application rates; read the instructions carefully prior to application. Clemson University Cooperative Extension states that pre-emergence herbicides are the best weapon against crabgrass (Digitaria spp). If you are able to apply it in time, pre-emergent herbicide is the best to use for St. Augustine and all grasses because it prevents the germination of weeds. 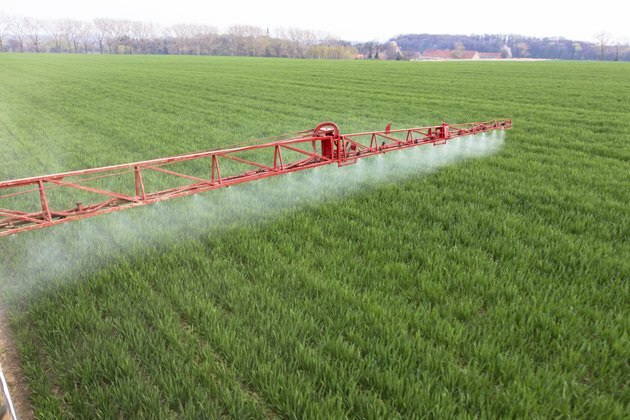 Before applying any herbicide, it's important to know what to look for on the label. Herbicide products often target only a certain selection of weeds and plants. Before heading out to the hardware store, find out what weeds you have growing in your lawn. If you're unable to find out, at least know the basics of the weeds. Grassy weeds have longer, narrow leaf blades, like grass. Broadleaf weeds, as the term implies, have broader leaves with netlike veins. Annual weeds complete their life cycle within a 12-month period, like annual bedding plants; perennial weeds, however, grow for at least two years and are more difficult to control. Buy a product designed to combat the types of weeds growing in your St. Augustine grass. St. Augustine grass is known to be sensitive to certain herbicides, particularly those containing 2,4-dichlorophenoxyacetic acid, also known as 2,4-D. This particular herbicide is a widely used broadleaf-weed control and plant-growth regulator. To know whether or not the product you choose is safe for St. Augustine grass, read the product label to see if it is listed for use on St. Augustine grass. Weeds flourish in an unhealthy lawn; therefore, a healthy, vigorous lawn is an ideal start to a weed-free yard. Weeds begin to take over when your St. Augustine grass is damaged from cultural problems or pests. Proper management practices can keep weed problems at bay. Management practices include proper fertilization, mowing and watering. Texas A&M University Extension recommends mowing St. Augustine grass at 2 1/2 to 3 inches and mowing frequently at low heights. Fertilize with 1 pound of water-soluable nitrogen per 1,000 square feet every eight weeks, and water only when your lawn needs it.